The Convention on Biological Diversity (CBD), an international agreement signed by 150 government leaders, has adopted the International Pollinators Initiative (IPI). The purpose of the IPI is to promote the conservation and sustainable use of pollinator diversity in agriculture and related ecosystems. It recognizes the need to monitor changes in the diversity and numbers of pollinator species. The CBD also incorporated pollination into its 2008 theme of biodiversity and agriculture for International Biodiversity Day in May to educate the public. Seeds of Diversity Canada and the Environment Canada Ecological Monitoring and Assessment Network (EMAN) have launched a countrywide monitoring program called Pollination Canada. The public is invited to record types and numbers of pollinators in their communities. The North American Pollinator Protection Campaign (NAPPC) was established in 1999 to encourage the health of resident and migratory pollinating animals. Several agencies and organizations from Canada, Mexico and the United States are partners. This organization helps individuals and organizations reduce risks to pollinators from pesticides, create pollinator habitat, and generally follow pollinator-friendly practices at home and at work. Help scientists monitor the changing health and status of pollinating insects in Canada. Join the countrywide survey of pollinators sponsored by Pollination Canada. 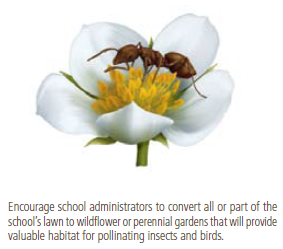 Encourage school administrators to convert all or part of the school's lawn (lawns are mainly made up of wind-pollinated grasses) to wildflower or perennial gardens that will provide valuable habitat for pollinating insects and birds. Visit Wild About Gardening for ideas. Plant a variety of perennials that produce flowers of different shapes, colours and blooming times. Not surprisingly, native species are best for encouraging our homegrown pollinators. Reduce or eliminate your use of pesticides and herbicides that poison friend and foe alike, and that accumulate in the environment that we all share. If pesticides can't be eliminated entirely, avoid their use at blooming times. Encourage your school to leave uncut buffer zones around sports fields. They will soon bloom with a plethora of pollinator snack bars. Establish a pollinator-friendly garden in your school yard or at home (see "Plant a Butterfly Garden"). Visit Wild About Gardening for more ideas for pollinator gardens. Submit a Habitat 2020 project for pollinators. Have the students write to their municipality and school board to ask if these organizations have a "no cosmetic pesticides" policy. If they have a policy, congratulate them. If they do not, ask them to consider it (support your request with research that your class performs).